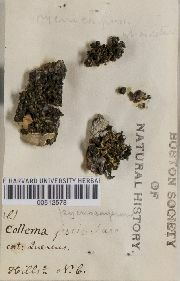 Thallus: foliose, small, 2-10 mm wide, forming rounded cushions or ±spreading and up to 5 cm across lobes: few, 0.5-.15 mm wide, flattened, appressed to erect, usually repeatedly branched, distinctly swollen with entire or crenate to lobulate margins upper surface: dark olive-green to somewhat brown or black, dull, epruinose, smooth or sometimes verrucose isidia: absent lower surface: usually paler than the upper surface Apothecia: in var. conglomeratum usually numerous, crowded, often hiding the lobes, often compressed, sessile, with constricted base on lobe margins or terminal on tip of lobules, 0.5-1.5(-2) mm wide; in var. crassiusculum more scattered, not hiding the lobes, 0.5-1.5(-2.5) mm wide disc: plane to convex, dark red to reddish brown, usually glossy, smooth, epruinose thalline exciple: rather thick, eventually disappearing, entire, smooth, inconspicuous or slightly prominent; pseudo-cortex: absent or poorly developed true exciple: thin, up to 20 µm thick in central part, euthyplectenchymatous or rarely almost subparaplectenchymatous hymenium: hyaline, 60-80 µm tall asci: clavate, small, 40-50 x 13-17 µm, 8-spored ascospores: hyaline, fusiform with acute apices (to partly subovoid or short-ellipsoid), rarely constricted at septa, (8.5-)10-24(-26) x 3-4.5(-6.5) µm Pycnidia: common, immersed, +globose conidia: bacilliform, usually slightly swollen towards the ends, 3-4 x 1 µm Spot tests: all negative Secondary metabolites: none detected. Substrate and ecology: on bark in nutrient-rich sites in woodlands and forests of the mountains World distribution: North America and Europe Sonoran distribution: central and southern Arizona, Baja California, Baja California Sur, Sonora, and Chihuahua. 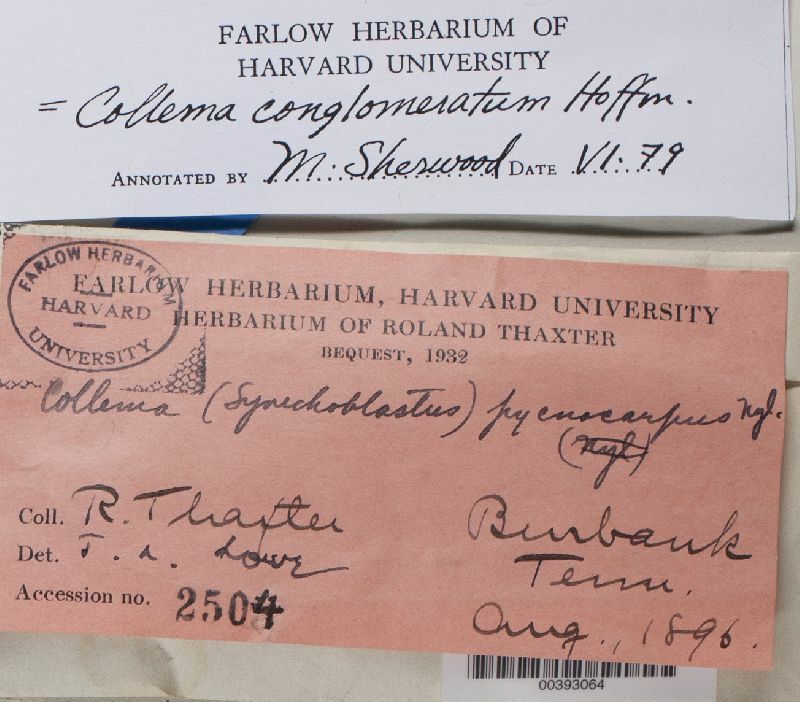 Notes: There are three varieties of Collema conglomeratum, all of which occur in the U.S.A. In the Sonoran Region, however, only var. conglomeratum and var. crassiusculum were observed. They are characterized by their swollen, folded and plicate lobes, the euthyplectenchymatous proper exciple, their fusiform 2-celled ascospores, and the corticolous habitat. In var. conglomeratum the thallus is roundish with crowded apothecia terminal on the tips or margins or short lobes; whereas in var. crassiusculum, the thallus is more spreading with appressed, elongated, marginal lobes and densely plicate, swollen, erect lobes in the center.